Whenever master sculptor John Schmidt teams up with taxidermy innovator Roger Martin, great things are sure to come out of it. These two have been diligently working for the past few years on a newly designed black bear mannikin which solves many of the problems that can arise when mounting. The result of their collaboration is a beautiful head which makes even the smallest bear trophy look impressive, handsome, and majestic. To redesign a closed-mouth black bear mannikin for the future, Roger and John went back to the original skulls to start over with a fresh interpretation, tweaking the anatomy to produce the look of a full, deep, round head. They drew upon their 30 years of experience mounting black bears and went to work studying reference, sculpting, test-fitting skins, and sculpting some more. They knew that often the heads of smaller bear trophies end up looking weak and skinny, and there was usually too much skin at the neck juncture, while not enough skin around the muzzle–which made tucking lips problematic. They also decided that this mannikin should utilize a preinstalled artificial nose, to eliminate the problems of improper sizing and misaligned attachment areas. They redesigned the lip line, added mass to the jowls, improved the ear base, and enhanced the head-neck junction area. This smaller (120 lb.) 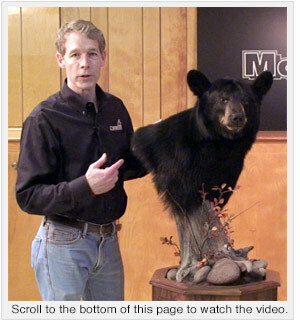 sow makes an impressive trophy when mounted on McKenzie’s new black bear pedestal form. Roger and John reworked the ear base design to offer ease of use and versatility with ear positioning. The ear canal reference points are clearly indicated and the mannikins feature a positive-set for the popular Buckeye black bear earliners. 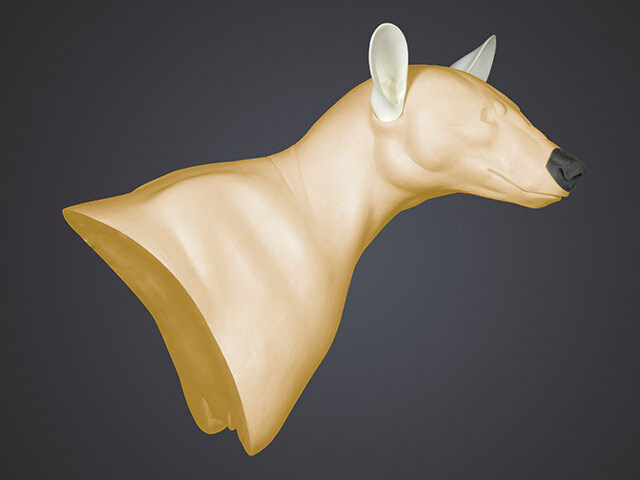 The ears can easily be rotated and positioned to any attitude while maintaining an anatomically correct placement. The ear canal reference points are clearly indicated and the mannikins feature a positive-set for Buckeye earliners. 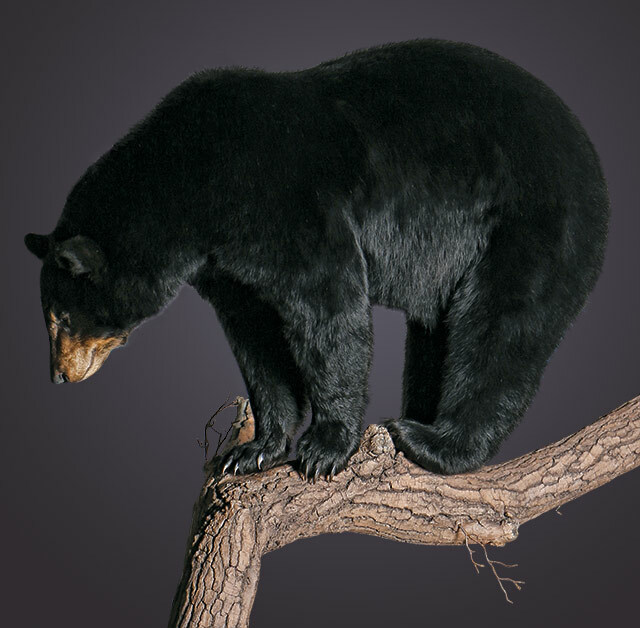 The result of these improvements produce a black bear mount that looks great from any angle. The new mannikin features combine to provide exceptional fit and create a robust look that makes even smaller bears look big and blocky. The mount goes together quickly and easily with just a minimum amount of clay around the eyes and earbutts, producing a beautiful result. A newly design lipline among with enhanced jowls helps create a pleasing profile and impressive head shape from all angles. 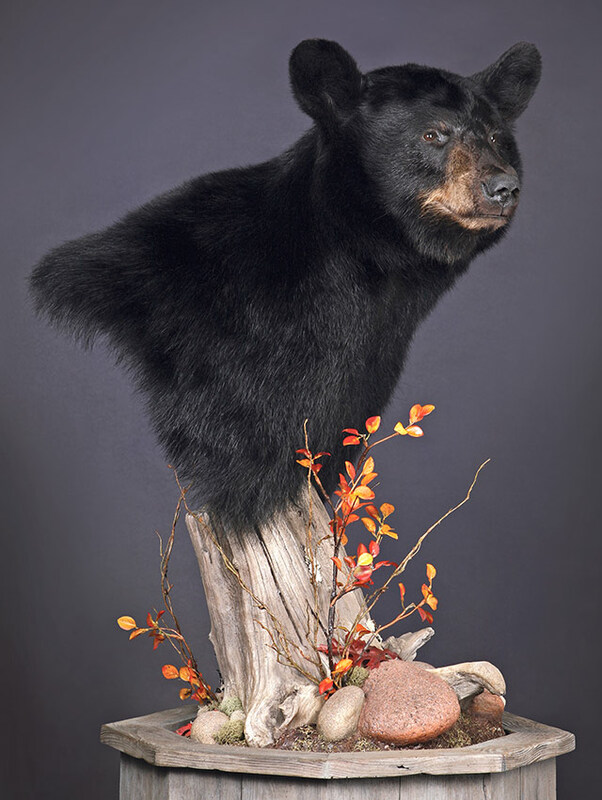 For the latest lifesize bear offerings from McKenzie, John Schmidt is using this new black bear head as the basis. This tree, habitat, and closed-mouth bear form were designed to be used together for maximum impact. John Schmidt has also incorporated McKenzie’s new closed-mouth head design into his latest life-size black bear mannikins. To help explain the features and benefits of these new mannikins, check out the short video with Roger Martin below. If you can’t wait to use these new heads, but need a different lifesize body or shoulder position, you can easily swap out the head with these new closed-mouth black bear change-out heads. Available in nine different sizes, all with pre-installed artificial noses, these heads can give a new look and new life to existing mannikin poses. Go here: http://www.mckenziesp.com/Black-Bear-Heads-John-Schmidt-C6179.aspx to find out more about John Schmidt’s new black bear change-out heads.